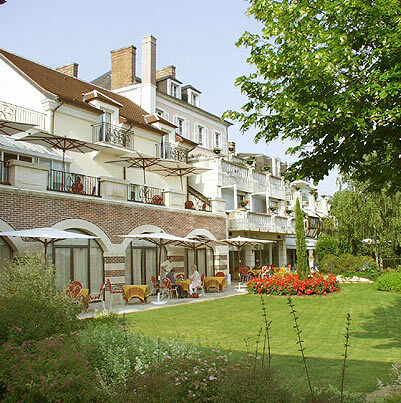 Hotel "La Côte Saint Jacques*****"
A Remarkable Burgundian World Class Hostelry. Only a family filled with more than average energy, enthusiasm and talent in their genes could have created and nurtured La Côte Saint Jacques into one of the top five star hotel and 3 Michelin star restaurants in the world and kept it there through two generations long before the Autoroute was built. Situated both on the main auto route from Paris to the south of France and on the much older waterway, the river Yonne, which before the age of the car, served for centuries as the transportation line from Burgundy to Paris, La Côte Saint Jacques, the family home of the Lorain family, has grown both in size and prestige undergoing a major addition in 2002 for the 2003 season and a make over in 2009. In 1971 with their first Michelin star, they put themselves so forcefully on the culinary map that they became a destination in their own right. Today and for many years they boast 3 Michelin stars for which both father and son can take credit. A tunnel built under the road from the original hotel building allowed them to double the size of the hotel and restaurant. Now they have the swimming pool and sauna, bar and breakfast rooms with the underpass tunnel that serves as an art gallery and, at a curve in the tunnel, a stadium style cooking school that son Jean-Michel conducts in French and English. The hotel is furnished in great good taste and individualism. Each room has its own character. The suites spacious and enormously comfortable. World class luxury and service is assumed. The attention to detail immaculate. With their new building project complete. Guests need never traverse the road to use the original house except for business seminars and other more commercial endeavors. They have retained the individual facades of the town houses, each painted a different color. Behind the charming facades, they have completely gutted and modernized the interiors.